Kinetic Sand is the squeezable sand where you can FEEL the fun! You've seen it before, but you've never felt anything like it! Pack it, pull it, shape it and love it, Kinetic Sand is so incredible you can't put it down. ​Now with the Kinetic Sand Sandbox, kids can play on a large play surface while containing the mess! 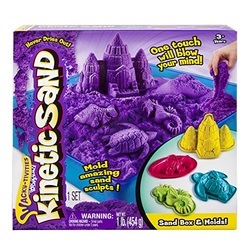 Mould amazing sand sculpts and have endless hours of fun with the Kinetic Sand Sand Box! 98% sand, 2% Polymers and 100% fun! Create amazing sculptures with the incredible sand that never dries out, Use the four different moulds to design magical underwater scenes. When you're done, just squash it down and start again Cleans up easily, your hands stay clean, easy to shape and mould, and it is completely wheat, gluten and casein free! Please note that the box pictures shows 2lbs of sand, but only 1lb is provided in the kit.